Join the discussion on our forums! 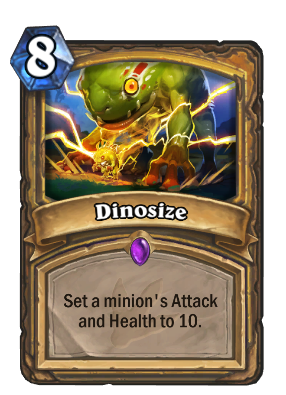 Come discuss Dinosize over in our dedicated Dinosize discussion topic. Congratulations! You have just played a Faceless Behemoth! I can't tell if this is a Hearthstone card or the next logical size up for McDonalds after the "Supersize." And so it came to pass that on this date, the Murlocs evolved into the Krogan. This card apparently had a Mass Effect on their population. *normal voice* "reporting for duty"
I've got the beast in my sights! Finally! Wisp, it is your time to shine! unbelievably bad. mind boggling, actually. hm...let's see...Paladin already has the best 8 drop in the game, the 2nd best 8 drop in the game, and the best 8 mana spell in the game. I know! Let's give them another 8 mana cost card! Just to round out the 8 slot. But not just any card, a really gimmicky, highly situational buff card! That should really sort Paladin out. On the plus side, if you ever want to actually play Paladin, there's always wild. Just don't ask any questions. It's none of your business. I'm legit scared by looking at this card right now! Some OP combo going to happen right? Could see this played in a Finja deck. Not possible with the second buff to get it to 20/20, as the card sets a minions attack and health to 10/10. This reminds me so much of Gigantiform from Magic: The Gathering. Making a creature a 7/7 no matter how small it was.